We both screamed in delight. Not only were we pregnant at the same time but we were also going to share a lifetime of experiences. The business relationship only lasted a few more years but our friendship is still going strong. We both raised sensational looking daughters who turned out to be geeks. My daughter Whitney is very well known in the field of UX–User Experience–and Barbara’s daughter is the famous Internet personality, Veronica Belmont. 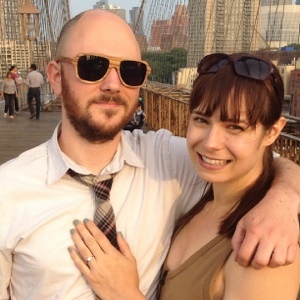 Barbara just emailed me from Hartford, CT, that Veronica just got engaged to long time boyfriend Ryan Block, Founder of gdgt. I am presently touring in Croatia but my thoughts bounced back 30 years ago when we made Whitney and Veronica hold hands for a photo op. As we snapped their picture we told our daughters we would all be friends forever. I now have the pleasure of publicly wishing my dear friend Barbara a hearty congratulations and wishing the newly engaged couple the best of everything. Eliot and I are thrilled for all of you. For those who don’t know Veronica and Ryan, here are brief bios. Veronica is a technology and gaming-centric video host based out of San Francisco. Currently her projects include Tekzilla (a weekly tech help and how-to show on Revision3.com), and The Sword and Laser, a science fiction and fantasy podcast and community, co-hosted with Tom Merritt. She has also written for Slate, DoubleX, MaximumPC and PC Gamer, and was the original host of Qore on the PlayStation Network. Veronica initially made her mark as a producer and on-air talent for CNET Networks (now CBS Interactive). She worked on such shows as Buzz Out Loud, MP3 Insider, Crave, and Prizefight. In 2007 she left CNET to host the eclectic video show Mahalo Daily, which was named one of the top new podcasts in 2008 on iTunes. Ryan Block is co-founder of gdgt, a consumer electronics media startup (funded by True Ventures, Spark Capital, and Betaworks, among others). He was also former editor / editor emeritus of Engadget, a web magazine and network of sites focused on obsessive coverage of consumer electronics and technology. As a technology critic and commentator, he has been quoted by the BBC, Business Week, Chicago Tribune, The New York Times, The Guardian, The Times, and The Wall St. Journal. Ryan also appeared on such networks as the BBC, CNN, NPR, PRI, and G4. He was also named one of Forbes’s 2007 Web Celeb 25. This entry was posted in digital, senior lifestyle, tech and tagged gdgt, Ryan Block, Veronica Belmont by loiswhitman. Bookmark the permalink. Send me your engagement website or are you too hip for that? I don’t want millions of people to see me in a bikini anyway. One would so think unless one is familiar with him and his history. They spend a lot of time and money on it so she will really appreciate it when you tell her how much you like it. person’s web site link on your page at suitable place and other person will also do similar in support of you. this technological globe everything is available on net? of your website and keep checking for new details about once per week.